Materials: textiles of cotton m. 3.500 x 1.50; sand: cubic metres 6; orchids:. 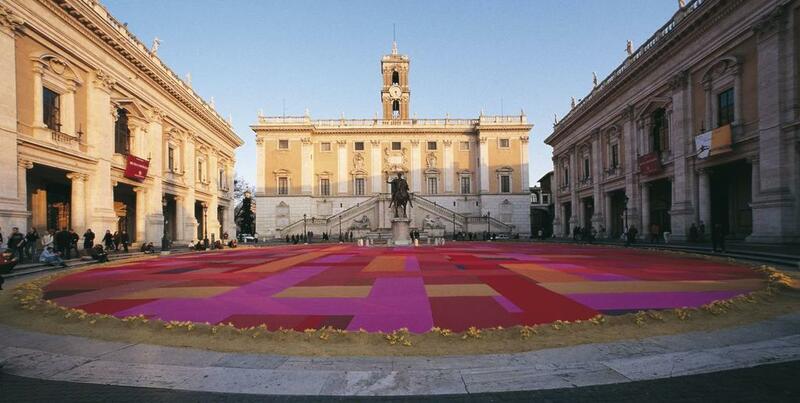 In March 7, 2003 Maria Dompè was invited by the Assessor for Cultural Politics and Equal Opportunities for Rome’s government to realize a site-specific work in the Piazza del Campidoglio. The installation involved the entire context of the setting, beginning from the staircase that fits into the steep profile of the hill. The ascending path is, in fact, an experience of catharsis, of authentic reconciliation with oneself. In this fulcrum of civic life, Maria Dompè prepares an incursion of extraordinary sensorial impact that lucidly catapults the observer into a dreamlike dimension that is pregnant with meaning: “Fragrances, colours, perfumes, sounds that recall the earth of Amina in a great mandala of peace.” Thousand of orchids, arranged on the sand like a votive offering, outline the oval perimeter of the piazza. Their morphology is a symbol of femininity, a value that we are invited to celebrate on this day, the “festa della donna,” a day devoted to women. 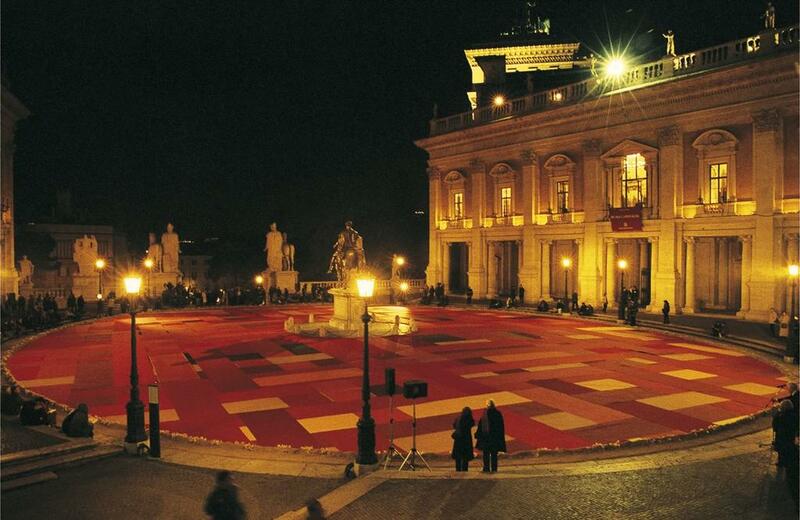 However, the event is not ruined by the popular nature of the happening, a commercialized media event. On the contrary, the ceremony inspires the sacredness of the rite, which requires dignified and orderly participation. The work is devoted to Amina Lawal, the Nigerian woman unjustly sentenced by her country’s court to capital punishment by stoning. The charge: adultery, invoked as a reasonable justification and materialized in the flesh and bones of Wasila, the baby who is the fruit of this sin; a terrible reminder of death that weighs on the head of this convict, waiting for the execution which has been postponed to January 2004, when the child will no longer need mother’s milk. With her unmistakable delicacy, Maria Dompè sprinkles the earth with flowers, an antidote to the stones used by the sharia. The perfume dispersed in the air stimulates the olfactory senses; it’s not a narcotic made up of artificial chemical odours. The sound spreads throughout the space, stimulating an intense emotional participation by the public. 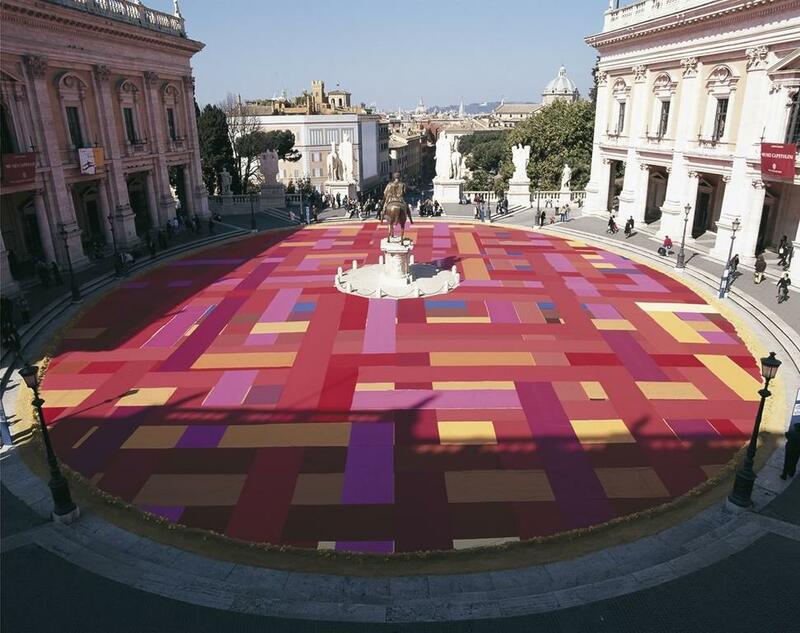 The cotton textiles create a polychromic mosaic in the Michelangelo designed piazza, suggesting the idea of something woven, of things coming together, the world’s navel and the theatre of differences. 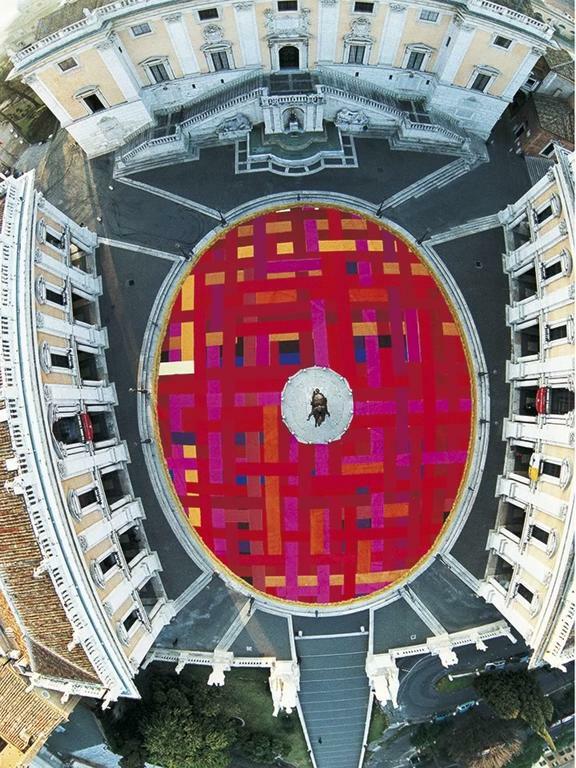 The appeal launched from the heart of the eternal city, crossroad of cultures and birthplace of legal rights, resonates in the collective conscience as a message of peace and tolerance. This Nigerian woman is, moreover, an exceptional testimony in this critical moment in international history, a time blinded by the madness of war. Her personal destiny is joined with that of humanity, stimulating an extraordinary expression of solidarity, rewarded by the liberation of Amina on September 26th 2003.